Here's another alternative use of the Lee Clarion: clothing. In the shot above, Richard Yeakley poses with a Lee Clarion tie crafted by copy editor Sara Dawson. 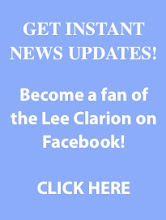 • See other unusual uses for the Lee Clarion, or submit your own! If you've found a novel use for the news (after reading it of course), send in a photo and a description to editor@leeclarion.com!